We kick off another great year for cargo bikes with wonderful news from France. The City of Boulogne-Billancourt, near Paris, is launching a project called 100 Triporteurs - 100 Cargo Bikes - in Boulogne-Billancourt. It's a project that Copenhagenize Design Co. loves and it is perfect inspiration for our Cyclelogistics.eu project. The company Michel & Augustin is known for both its creative marketing and its delicious cookies. They were looking for a new media to communicate through and that can contribute to a positive paradigm shift in urban life. Together with the Danish cargo bike brand, Nihola, they are launching a cargo bike project aimed at changing peoples perceptions about how to get around the city. 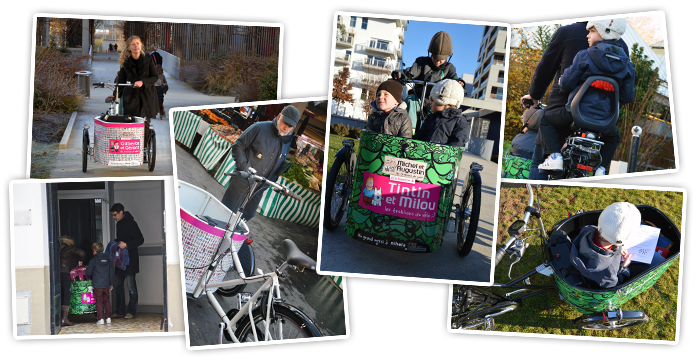 Thanks to this project, citizens in Boulogne-Billancourt can buy a Nihola cargo bike for €1000, instead of €2600. They can also be a part of the new community of Citizen Cyclists who want to make some life changes and also take part in events organised by the funky company. Michel & Augustin think an urban revolution is possible by using innovative means of transport. Not surprisingly, we at Copenhagenize Design Company feel the same way. Bikes and cargo bikes are fantastic tools for changing urban life for the better. Cargo bikes are a perfect means of transport for families and we our proud to be a part of the CycleLogistics.eu project. Here is the video about the beginning of the paradigm shift in the Paris area. 100 triporteurs dans Boulogne-B from Michel et Augustin on Vimeo.